Created by JJ Villard (Shrek 3 and 4), the show follows the eponymous King Star King, a muscly fry-cook who goes adventures through space in his spaceship/waffle restaurant, The Waffle Zone. He's accompanied by Pooza the perverted wizard, Gurbles the bear (that orange thing? ), and Hank Waffles, the mascot. Their journey is described as unending, psychotic, and hallucinatory, and their goal is to help good things and kill bad things. My guess is they're going to have a hard time telling the difference between the two and end up destroying everything in their path. The good news is we won't have to wait long to find out if the series is good. 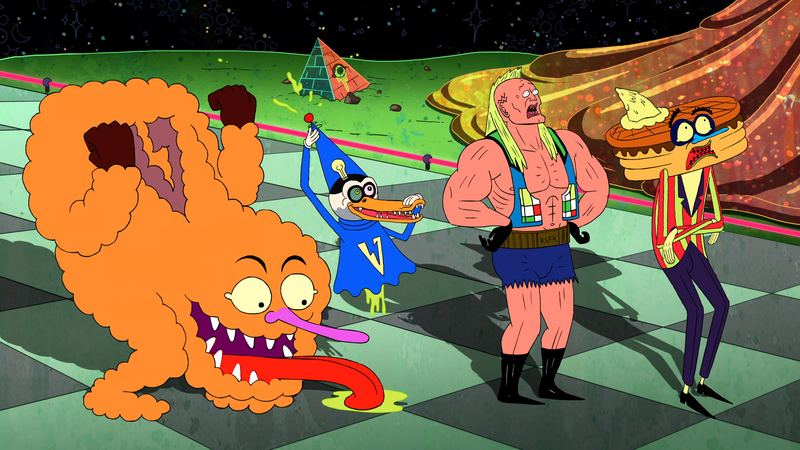 Adult Swim will premiere the six episode season online this Sunday, June 15th. Oh, and there's a contest too, with original art from Villard on the line. You can enter online at Adultswim.com. In the meantime, I'll be in the corner, mentally preparing myself for this impending acid trip through a comedy filled nightmare. Here's hoping we come out of this with some laughs.